Smart Forfour Volkswagen Buying Hatchback Car reviews up! Volkswagen has expanded its Up! lineup with 5-door and crossover-styled models, while Smart has launched the all-new ForTwo and ForFour. We compare the Cross Up! and ForFour (52 kW Prime) to find out which one is the better buy. Don't let the lighter hue of the Smart fool your eyes, the Up! is fractionally longer than its rival. The Volkswagen Up! took a while to reach South African shores, but since its arrival many have rolled off showroom floors. It's clear that this pint-sized VW has a lot going for it. However, the lack of an extra pair of doors (compared with a conventional small hatchback) is a drawback; if you consider how well Mini has done with the introduction of a 5-door Cooper, practicality is a major factor for buyers, even for those of so-called boutique cars. 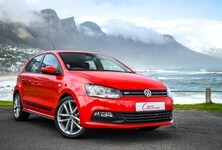 VW has addressed this with the striking 5-door Colour Up! and crossover-styled Cross Up! Conversely, Mercedes-Benz's city car arm Smart has returned with new versions of its ForTwo and ForFour. With four occupants being the key point here, can the new Volkswagen 5-door Up! match the cute and funky Smart ForFour? There are 5 versions of 5-door Up! but this Cross Up! is the most striking visually. It features some rugged touches such as roof rails, unique alloy wheels, black wheel arches as well as a raised ride height. While it looks like it could go off-road, it's a city slicker through and through. Compare the Volkswagen Cross Up to the Smart ForFour here. Mechanically, the VW and Smart have quite a bit in common. Both have naturally-aspirated 1.0-lire engines mated with 5-speed manual transmissions and their outputs are 55 kW/95 Nm and 52 kW/91 Nm respectively. Although they're closely matched on paper, the Up! feels less strained on the open road. When you're packing under 100 Nm, in-gear acceleration is not a forte and overtaking manoeuvres require a combination of planning and quick downshifts, especially at freeway speeds. The Up! copes... just, while the ForFour struggles unless you really thrash it. Perhaps the Volkswagen's cabin has better sound insulation; its engine certainly feels the more refined of the two and while it emits that typical 3-cylinder rumble, it's not as obvious as in the Smart. The pair's compact widths make them palpably easy to park in confined urban areas. Put either car in the confines of a city and you'll feel the difference immediately. This pair is tailor-made for the urban sprawl and the closely-spaced ratios of their gearboxes make them sprightly to drive. If you need to parallel park or nip into (or out of) small gaps in traffic, the VW and Smart are ideally-sized, plus both cars have light and quick steering setups. As long as you don't have to travel great distances, where their short gearing and 35-litre fuel tanks will be disadvantages, you should be satisfied with their performance and economy. The Smart is claimed to consume just 4.2 L/100 km and the VW 4.7 L/100 km, but our test revealed that the Up! was lighter on fuel as the engine didn't need to be pushed as hard. Incidentally, the VW weighs less than the Smart. This Smart's (Renault-sourced) 5-speed manual is pleasant and light, something you'll appreciate in thick traffic, where you'll be working the clutch and gear knob incessantly. As good as it is, it's not as slick as the VW's 'box, however, and therefore the Up! edges the ForFour in terms of driving dynamics. The conventional configuration of the Up! gives it a luggage capacity advantage over the rear-engined ForFour. The ForFour is at an immediate disadvantage because its engine is located at the rear – where most cars have their luggage compartments. The vehicle does have a luggage compartment, but it isn't particularly deep. The optional sound system that came with our car also doesn't help space availability, but we discovered that the JBL subwoofer could be removed if you urgently require extra carrying capacity. Unlike a mid-engined Porsche (such as a Boxster, Cayman or 911), which has its engine behind the passenger cell and a cargo area in its nose, the Smart has some mechanical components in its nose and offers a pocket of space at the front. The front cover comes off courtesy of quick release clips and is easy to put back (with practice). Despite the ForFour being the bigger of the two Smart products, it still feels a little tight in the cabin and rear legroom is not adequate for anyone over the age of 12. Furthermore, taller drivers will find that their heads gently brush the roof. The interior packaging (and, therefore, space utilisation) of the Volkswagen Up! is better. The luggage bay floor can be lowered for extra loading capacity and the sculpted shape of the front seatbacks means that adults have a bit more kneeroom when they're sitting in the back. Having said that, fully-grown adults will still find the rear quarters cramped. The cumbersomely large doors of the 3-door Up! have been replaced by smaller doors that make getting in and out of tight parking spots far easier. It may be a compact car, but the clever use of space makes the VW's cabin relatively spacious. The interior detailing of the Up! is devoid of frills, but the build quality is excellent. Oh, Volkswagen's rivals must loathe how the Wolfsburg-based firm continues to set the standard in terms of interior finishes and general build quality. It may be one of the cheaper Volkswagens on the new vehicle market, but the Up! feels substantially better-made than most of its rivals. It's well assembled and while the purchase of an Up! may signify that you're at the lower end of the market, it doesn't feel like "a poverty-spec car". In Cross Up! specification, the dashboard is a bright red colour, which adds some character, but there's nothing unique nor striking to the general design. It all feels built to last and well put together, but other than the ventilation and audio controls on the Volkswagen's chunky fascia, the dashboard of the Up! is minimalist and basic. Apart from the old-school sliding interior temperature toggle, the Smart's fascia feels completely up to date. The Smart's interior is comparatively more modern and much funkier. See, Smart collaborated with French carmaker Renault when it designed the ForFour's interior and it'll take fans of La Regie's products only a few seconds to realise that this cabin feels vaguely familiar. We say vaguely because this cabin is based on the not-in-SA Renault Twingo (the rear-engined cutie that is popular in continental Europe). Some may argue that the Smart has far too many toggles on the steering wheel, but after driving the vehicle for an extended period of time, you appreciate the convenience that these buttons afford. The rest of the ForFour's cabin is interesting and quirky, which is what Smarts are all about. We liked the separate rev counter, which is located away from the rest of the dashboard, while the ventilation control with the magnifying glass is a cute, if old-fashioned, touch. Gadgets and gizmos aside, the Smart interior feels solid, but the gloss black plastic may be prone to scuffing. It's not as solid as the Up! 's cabin, but it certainly has more pizzazz. This Cross Up! came with a few additions such as heated seats (R3 300) and the Tornado red paint costs R950. If you want the convenience of Bluetooth connectivity with an SD card slot, you'll have to fork out a further R3 600. A multifunction display with cruise control and park distance control comes in at R3 600. What are you getting without these options then? The Up! comes standard with front power windows, a height-adjustable driver's seat, manual air-con, trip computer, 6 airbags... that's about it. Standard Bluetooth, cruise control and a multifunction steering wheel set the ForFour apart. The Smart has more features than the Volkswagen Up!, but you'd expect this given its higher asking price. Both cars have ABS-equipped anchors, but the Forfour's electronic brake force distribution and brake assist mean it should be more effective during emergency stops. The Forfour is comprehensively equipped with cruise control, Bluetooth connectivity, USB/aux inputs, steering wheel controls, climate control, and electric windows. You can opt for one of many packages which come with things like bigger wheels, a JBL sound system as well as a smartly-designed media system with navigation. Prime specification adds alloy wheels and a leather interior, and you can customise your ForFour to high levels of detail on the online configurator. What's particularly important to note is that several safety features from parent company Mercedes-Benz have been passed down: the Forfour range features crosswind assist as standard as well as five airbags. Forward collision warning and lane keeping assist are optional. The rivals' black and grey cladding set them apart from run-of-the-mill "shopping trolley" hatchbacks. This looks like a clear-cut victory for the Volkswagen from a consumer point of view. However, Mercedes-Benz Smart never said it was targeting the lower end of the market and the ForFour is a premium city car, whereas the Cross Up! is a budget-busting champion. 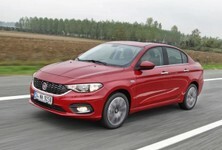 The Smart offers far more in the way of personality and if you tick the right boxes, safety technology not seen before in this city car segment. If city cars all came with these features, the world would be a better place. 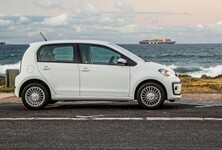 In this battle however, it's really hard to argue against a 5-door Volkswagen Up! The highly-rated 3-door Up! 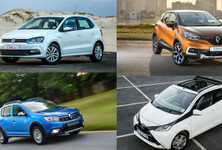 was a Cars.co.za Consumer Awards finalist in the Budget Car category. The 5-door expands on this offering and as someone's first new car, represents excellent value. The Cross Up! adornments are an indulgence; you can save further Rands by buying the Up! in Move Up! 5-door specification which costs R167 500. The Smart ForFour is not disgraced, however. It is arguably better looking than the VW and offers charm and personality that the more utilitarian Up! can only dream of. The cabin is a fun and it makes its rivals' interiors look bland by comparison. It won the hearts of onlookers and we really like this generation of Smart vehicles thanks to their looks and compact nature. As far as Smarts go, this is the best yet and so much better than the previous generation car. 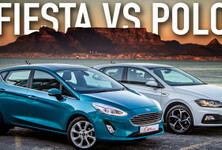 However we're a consumer-focused publication and the point of this evaluation was to find which car was the better vehicle to buy. It may not have the edgy personality or 21st-century tech savviness of the Smart Forfour, but the 5-door Volkswagen Up! is an excellent product and is our choice here. In terms of warranty and after sales, the Volkswagen has a 3-year/120 000 km warranty with optional service or maintenance plans. The Smart, by comparison, has a 2-year/unlimited mileage warranty and comes with a 3-year/60 000 km service plan.